Today, we are comparing the Nokia 6.1 Plus with the Xiaomi Redmi Note 5 Pro to see what these two devices has to offer on paper. The Nokia 6.1 Plus was revealed in India last week along with the Nokia 5.1 Plus. The highlights of this smartphone are its vertical dual-rear camera setup, Snapdragon 636 processor, and the notch on the display. On the other hand, the Xiaomi Redmi Note 5 Pro, which is a pretty popular phone and is available for around the same price as the Nokia 6.1 Plus. 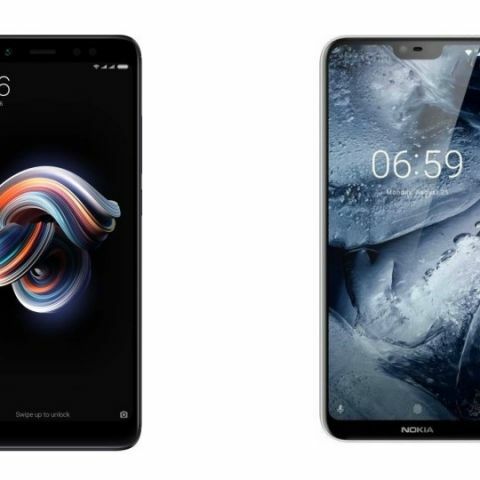 The Nokia 6.1 Plus is priced at Rs 15,999, while the 4GB variant Xiaomi Redmi Note 5 Pro is now priced at Rs 14,999 in India, after initially being available for Rs 13,999. The Xiaomi Redmi Note 5 Pro has a slightly bigger display than the Nokia 6.1 Plus. if you love consuming a lot of video content on your phone, then the Xiaomi Redmi Note 5 Pro might be a better option for you. Coming to the processor, both of these devices comes with a Qualcomm Snapdragon 636 processor, which is paired with a 4GB RAM/64GB Storage. Now let's talk about the cameras, both the smartphones have a dual-rear camera set up at the back. However, Nokia's 16MP + 5MP setup looks better on paper than the Xiaomi Redmi Note 5 Pro, which comes with 12MP + 5MP sensors. Although, the Redmi Note 5 Pro offers a better camera on the front than the Nokia 6.1 Plus, as it has a 20MP unit on the front in comparison to the Nokia 6.1 Plus, which has a 16MP sensor at the front. It should also be noted that the Nokia 6.1 Plus (like all of the company's recent devices) is a part of Google's Android One program. This means that the phone will be one of the first devices to get updates as they are released by Google. On the other hand, the Xiaomi Redmi Note 5 comes with MIUI 9. So if you're a fan of stock Android, you might prefer the Nokia 6.1 Plus more.